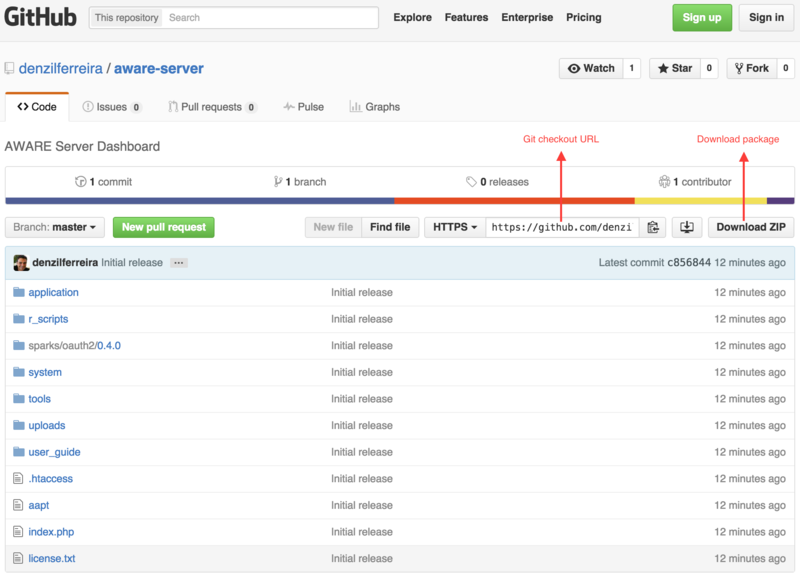 We have made our server component (AWARE Dashboard) open-source over GitHub. This allows you to host your own server and full control over the AWARE Dashboard. Feel free to break it, fix it, enhance it and share it back. “With great power comes great responsibility” – Uncle Ben, from Spider-Man. This tutorial is not for everyone. If all you need is to host a study database, we do offer a remote database setup per study in our own AWARE Dashboard. We use a self-signed SHA-256 with a 2048-bit long RSA strong encryption key on our setup in all communications between clients and our server. It is your responsibility to make sure you do too. We are not responsible for any misconfiguration from your side! At its core, the current version of AWARE Dashboard runs on top of a LAMP (Linux, Apache, MySQL, PHP) + a Mosquitto MQTT Server infrastructure. There are many guides online on how to setup your own LAMP server, and they depend on the distribution you use. We use Ubuntu 14.04 LTS on this guide, but these instructions should be somewhat compatible with other Linux distributions, adjusting accordingly to your distribution package manager and package names. Install your LAMP stack before continuing this tutorial. There is an official client from LetsEncrypt that generates a valid SSL certificate that you can use with your AWARE server. This assumes your server has a registered domain associated with it (henceforth referred as YOUR_DOMAIN). Please replace YOUR_DOMAIN with your own server’s public domain name. The client is called CertBot (https://certbot.eff.org/). Specify your server configuration and a certbot executable will be made available to you. Selecting Apache and Ubuntu 14.04, you need first some packages. CertBot allows you to automatically configure Apache and assign the certificates to your host. Please refer to Certbot’s official documentation if you encounter any issues regarding deploying LetsEncrypt certificates on your server. You can now go to step 1. The following commands (as $) will install the necessary packages and create the files you will need to secure your LAMP and Mosquitto servers. We are creating a strong SHA-256 2048-bit RSA encryption certificate, just like ours. When creating SSL certificates, the most important piece of information to validate the server URL/IP is the Common Name, which always needs to match your server’s domain/IP. The Common Name must be the same for both the Certificate Authority (CA) and the server SSL certificate. We encourage you to use Git to checkout the code, since it is easier for you to update your server as we fix any reported bugs and integrate new functionalities. However, if you downloaded the source as a .zip package, uncompress it to a folder (aware-server) inside your server’s Apache hosting folder (in Ubuntu, it is located in /var/www/html/) and go to step 1.4. This will create a folder called aware-server on the root of your Apache host. We will come back to this folder in the following steps. Go to step 2. Do not open your browser and point to your server URL yet, we still have setup to do. This will only update the core dashboard files, and leave your configuration files intact. We will now modify Apache to use HTTPS for the AWARE Dashboard, while still allowing access to the public certificates over HTTP. You need to replace YOUR_DOMAIN with your server’s domain or IP address (without leading http:// or https://). You need to specify where you put the private server.key of your server for HTTPS to work. We are also adding support for downloads of .apk files (Android apps), required to download plugins hosted on your server. This configures your Apache to use LetsEncrypt certificates, obtaining a grade A in SSL security (evaluated https://www.ssllabs.com/ssltest/analyze.html?d=api.awareframework.com&latest). We also need to export the certificates to a format that CodeIgniter (the PHP framework we used for the dashboard at the time) can understand. To do this, create a public folder that you will later need in Section 5.2, use openssl to extract the certificate and copy the ca.crt and server.crt to this folder (replace CRT_FOLDER with the path for the public folder reacheable in http://YOUR_DOMAIN/public), and lastly making them readable to Apache. By default, PHP limits file uploads to 2MB. This is not enough for nowadays’ Android package sizes. We will increase this size to 200MB, but you can choose any number you wish. We must create an empty aware_dashboard database. Don’t name it anything else, because the dashboard depends on it to work properly. In the following commands, we use the user root, but you should use your own credentials to your MySQL server that allows you to create databases and add new users. We now create a user (YOUR_DB_USER) for the dashboard with all privileges on this server. For security, this user is only allowed to login from localhost (i.e., your server), so no one else can use/access it remotely. This user manages creating and deleting the databases and user credentials per study. Don’t forget to change the bolded text with your user and password of choice on the following commands. We will now add the tables we need to the aware_dashboard database. These tables contain all the studies configurations, user accounts and all the information needed to manage the dashboard. Reset the study and start over data collection. # We will stop the service because we have to set it up! For security, each participant is assigned an MQTT client user and password, and each study has its own MQTT client credentials. This makes sure that only the study client can send messages to the participants of the study. This is automatically handled by the server using this adapter. When you install mosquitto in 3.1, note the version number. When you download the source code of mosquitto, it needs to match! We will now check if we have all the required libraries we need to compile the Mosquitto-MySQL adapter. Save and then compile the source of Mosquitto. We disabled DNS name resolving (not needed) and activated real-time websockets support. At the end of the compiling process, you will have a file called auth-plug.so in the mosquitto-auth-plug folder, which allows Mosquitto and MySQL to talk to each other. We’ll make it readable and we also need the path for this file on the following step. We need a PHP client for Mosquitto, allowing us to send MQTT messages to the participants on a secure SSL connection. We will need Android SDK command-line tools to parse uploaded plugins’ information automatically. # Save the file (Ctrl + X). We now install Android SDK. # This will take some time, depending on the network connection speed. Accept any licensing agreements and let it download all the SDK levels and build tools. To login on AWARE Dashboard, we don’t use usernames and passwords and instead we leverage Google’s OAUTH service. This provides a secure and fast way to identify yourself on your server. This also allows your do invite fellow researchers to use your very own AWARE Dashboard and share their plugins. The mobile AWARE application fetches our public plugins by default, and also what you have on your own server when you join a study hosted on your server. You will also need the Client ID (e.g., 90853489753.apps.googleusercontent.com) and Client secret (e.g., lkdfjglkjdsflgkj) for the final step. We now have all the infrastructure running. We now need to modify AWARE Dashboard config file to know where everything, OAUTH credentials is and your AWARE Dashboard is ready. You can now access your AWARE Dashboard at https://yourdomain. One last thing, you need to enable yourself as a manager of this server. You can do that by setting your user as a manager on the MySQL aware_dashboard database, table user_levels. You will find only one row for now with user_id = 1 (that’s you!). Change the manager value from 0 to 1. When you login now on the AWARE Dashboard, you can now manage other accounts’ access levels and more.